FEMM (Fertility Education & Medical Management) is a non-profit organization that is revolutionizing women’s healthcare. FEMM empowers women by helping them understand their bodies by recognizing hormonal signs of health so that they can better manage their health and their fertility. FEMM is teaching women the world over how to use their cycles as a means of assessing their reproductive and overall health. What exactly does FEMM do? • FEMM Education teaches women the link between hormones and health, and how to monitor observable hormonal bio-markers. Once girls and women understand their bodies, they can identify normal or abnormal cycle patterns, and seek medical support as informed participants in their own healthcare. • The free FEMM iPhone app allows women a quick and easy means of charting their day-to-day bio-markers, and is automatically programmed to flag abnormalities as they arise. The app allows women to track their fertility and their health so that they can more easily achieve their reproductive and health goals. The Android app is forthcoming! • FEMM Medical Management offers medical care that diagnoses and treats the underlying causes of reproductive dysfunction. Developed by the Reproductive Health Research Institute (RHRI) in Santiago, Chile (directed by Pilar Vigil, MD, PhD, OB/GYN), our medical protocols draw on the latest research in women’s reproductive endocrinology. They are the first medical protocols in the world to standardize specialized research in this way – with a focus on targeting the underlying problem rather than simply managing symptoms. We also provide a platform for women to reach FEMM-trained educators and physician when an issue is flagged. Moreover, FEMM offers training to individuals so that they can teach FEMM health tracking to women and training to medical professionals in the FEMM methods and protocols. Women have the right to be informed participants in their own healthcare, with the ability to make in-formed choices. Informed choice means making a health decision after learning about and considering all the options and information available. FEMM education provides women with accurate, unbiased, complete and comprehensible information. It is a change from managing symptoms (largely through hormonal suppression by way of the pill) to providing foundational diagnosis and treatment. 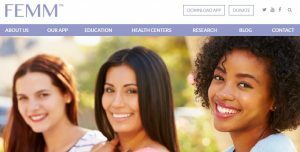 In essence, The FEMM model links health education (programs to teach teens, women and couples to identify and understand their hormone/cycle changes) to an app as well as to our medical program. By: Nerea Lopetegui-Lia, M.D. and Rosa Macrito, M.S., both currently enrolled in the FEMM Teacher Training Program.